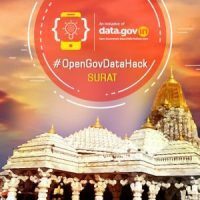 #OpenGovDataHack Pre-Hackathon Workshop has been organized at Sardar Vallabhbhai National Institute of Technology, Surat on 15th September 2017. The workshop was attended by more than 100 participants from faculty, students and start-ups from Surat. The session was organized by National Informatics Centre, Govt. of India and IAMA, with the support from StartupIndia. SVNIT students have extended their support in engaging students and app enthusiasts to get insights on OGD Platform of Government of India. The idea was to communicate the details of “#OpenGovDataHack” to be held in October 17. The workshop provided students with an overview, related challenges and phases of Hackathon. Prof. S. R. Gandhi, Director, SVNIT Surat, welcomed the guests & participants and need of data and benefit of hackathon. Mr. Anil Saraogi, President, South Gujarat Productivity Council, shared his views on the need of application and how data can be used. Prof. Anand Darji, SVNIT Surat, concluded the program with his vote of thanks.